We may be sold out for the forum on 16th May but don’t despair – we have created a waiting list in case of cancellations or withdrawals so if you would like to be included on the waiting list either add your name in a comment below or contact Alex. He is planning to email all unsuccessful applicants. Carol Craig draws heavily on the work of Carol Dweck on fixed and growth mindsets. Dweck has previously attended the Scottish Learning Festival in Glasgow – you can watch a recording of her talk in 2009, and see the mindset work above. On the 27th of November 3 Govan High pupils attended a SELMAS conference along with two teachers and the pupils were; Katie Hughes, Billijo Graham and Jennifer Baird. The conference was held in the Stirling Management Centre in Stirling University. As pupils, we found the conference enlightening and intriguing. During the conference there were guest speakers Craig Munro, Carol Craig, pupils from Preston Lodge and Don Ledingham. These speakers spoke in different ways and made us see the development of education in a new light. The main points we took from Craig Munro was ‘the point of context’. Craig Munro said you can’t judge a school purely on the figures. You have to look at the context, for example, taking into consideration factors such as ethnicity and deprivation in areas. Carol Craig spoke more about the mind and reminded us of a course we took called PX2. Don Ledingham came across as a passionate man while speaking. He made us believe he had a genuine care for our community. While speaking he interacted with the audience and used strong hand gestures. The most fascinating presentation was from Preston Lodge. They spoke about technology in schools, they told us about how they had developed the use of Google drive and documents with their teachers. They also explained how they had developed the use of twitter. The use of these devices in our opinion would enhance discussion and communication between teachers and pupils. This was very appealing to us as we think that we tend to struggle with homework and having contact with teachers out of school hours and this would improve this problem massively. But we cannot use these devices in school as they are blocked. We think this is ridiculous and Glasgow City Council are completely out of order. They are implying that teachers can’t supervise a class because the restrictions are in place and the council believe the pupils will take advantage and go onto inappropriate websites. After seeing the conference, wished we could have a chief executive in our council like Don Ledingham. The main thing we took from Carol Craig’s presentation was that it made us think about how should think about ourselves. As ‘Graduate’ pupils we are led to believe that we are not better than anyone else but Carol made us think that perhaps we should feel better about ourselves and if we don’t then there’s a problem. Everyone should have that mindset. Overall we took a lot from the conference and throughout we were undoubtedly engrossed in the ideas from the speakers. 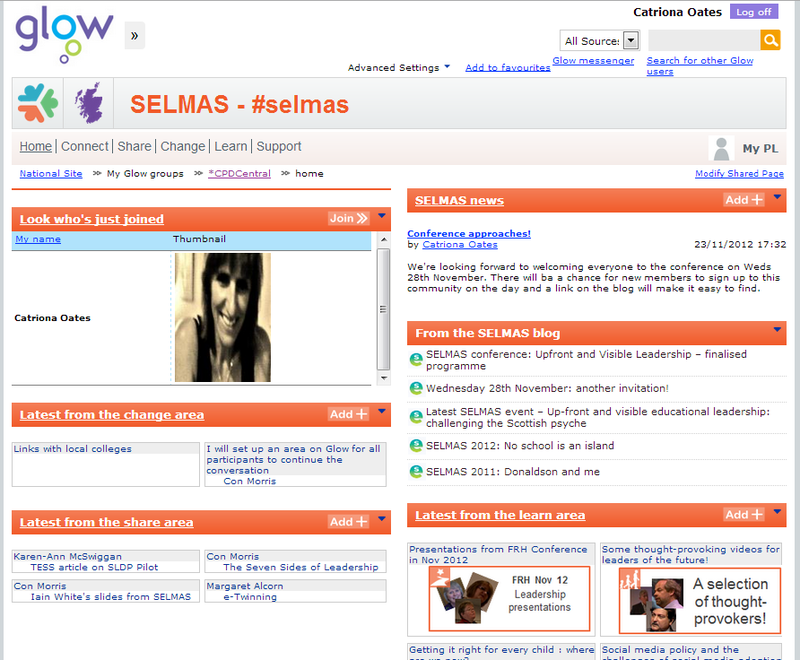 Join our online community on Glow: more SELMAS wisdom online! In advance of Wednesday’s conference, I’d like to invite you to join our online community by adding yourself to the it in connect area – just follow the instructions on the page (you need to have your Glow login and a photo handy). We’ll spend a bit of time exploring our online spaces on Wednesday but meantime, we are looking forward to seeing you at both our online and face to face learning opportunities! Our national conference is fast approaching and we are looking forward to seeing everyone in Stirling on Wednesday 28th November. The event has almost sold out, but if you would like to check for availability, contact Alex Wood . Here is the finalised programme for the day – it promises to be interesting, stimulating and we’re also hoping to build – in an online .dimension to the experience as well, more details on the day. Danny Murphy who will be chairing today’s conference, is former founder Director of the Centre for Educational Leadership at the University of Edinburgh, has been headteacher of three Central Scotland schools (Crieff, Mclaren and Lornshill) and is now part-time Senior Teaching Fellow at the University of Edinburgh and freelance educationist. 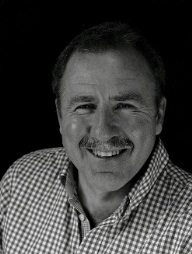 He is the author of School Leadership: Dealing with Dilemmas (2007, 2nd edition due next year) and School Leadership (with Jim O’Brien and Janet Draper) (2nd edition 2008). Dr Carol Craig, Centre for Confidence and Well-being: In this presentation Carol Craig will look at the main barriers to the development of individual self-confidence in Scotland and why she thinks modern, materialistic culture has a profoundly negative effect on how people feel about themselves. She will then outline the type of changes she thinks are required to foster confidence and ambition. Craig Munro, Head of Education (Fife Council), recently seconded as Strategic Director (Performance/Strategy) in Education Scotland.Until recently Craig chaired the ADES Performance and Improvement Network and was a member of the ADES Executive.Craig will discuss some of the barriers to raising attainment and ambition in Scotland and give practical examples of how some of these barriers can be overcome. He will draw on his experience as a teacher and in school leadership as well as his recent involvement in the preparation of the ADES raising attainment publications. Don Ledingham, Executive Director of Services for People, East Lothian Council and Director of Education and Children’s Services, Midlothian Council. Don Ledingham will explore in his presentation how educational leaders can make effective use of a values-based leadership decision framework which can help them to create the necessary conditions and ‘space’ for innovation and break free from top-down hierarchical models of practice. Jamie Halvorsen, Laura Turnbull and Paul Smith, S6 Students at Preston Lodge High School, will present a pupil perspective on learning in the 21st century. Eleanor Jess, headteacher at Riverside Primary in Stirling, Donna Murray, headteacher at Lochrin and Grassmarket Nursery Schools in Edinburgh, and Jon Reid, headteacher at Larbert High School, will provide the panel for the afternoon session.